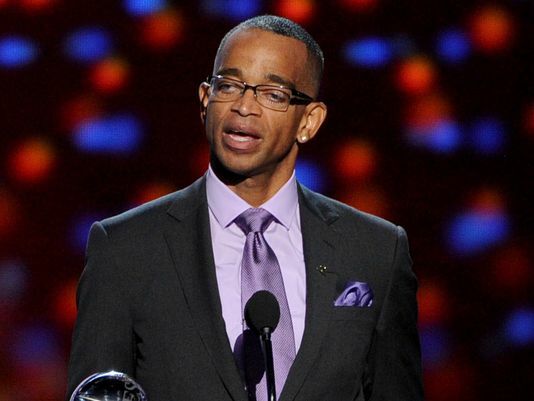 As the ESPYs approach, we remember longtime ESPN anchor Stuart Scott whom lost his private battle with cancer. He was 49. A graduate of the University of North Carolina at Chapel Hill, Scott got his start at a few stations in the south, making stops in North Carolina, South Carolina and Florida. He leaves behind a legacy that many anchors first dared to do and now aim to duplicate. Stuart Scott was a natural showman from the beginning. When I turned on Sportscenter, Scott resonated with me. He communicated with the world in a way that was frowned upon at first. Scott embodied the art of "code switching," as said by many of his colleagues. Code switching is a self-explanatory term; it is changing the way we talk or present ourselves to fit the needs of not just one audience, but multiple audiences. Scott revolutionized the field single-handedly. Scott looked to not only do his job the best way he knew how but also fearlessly put his own spin on to things, regardless if you liked it or not. Eventually everyone was repeating his catchphrases that included "BOO-YAH! ", and "He's cooler than the other side of the pillow," among many that would be repeated every time he was on the air for 21 beautiful years. Whenever I turn on my television to further learn about the man that is Stuart Scott as ESPN and other networks pay their respects, I further learn about the criticism his revolutionary style of news casting brought him. He used Black vernacular; he alluded to scenes in hip-hop and other avenues of black culture and to many black and whites that just wasn't how it was supposed to be done. Most viewers were accustomed to a very bland, "black-and-white" style of news casting. But to no avail, Scott never abandoned his authentic way of presenting news and sports. Not everyone could profoundly understand Scott's jargon, and not everyone could get with how he did his job. But if one thing is true, you cannot possibly please all the millions of people tuning in to see him at work. People couldn't stop watching, though. He was a likable person at heart, not even his far-reaching style could piss enough people off. The very way Scott presented himself; the flair and showmanship minus the gimmicks reflected his love for the world of sports. This is no guess, if you've ever watched any of Sportscenter, chances are you've caught Scott at his best, the state in which cancer couldn't even bring down on-air. His voice was always high-pitched, words enunciated and certain phrases were emphasized and in almost every highlight reel, Scott threw in one of his legendary phrases. If you're like me, you said the phrases with Scott because you knew which one was coming, you envisioned yourself in his seat, passionately presenting the world of sports to audiences young and old. No, Stuart Scott was not a savior for African-Americans; he wasn't a rebel, by no means. What Scott did was teach people to be themselves, learn how to be authentic in everything you do, even if it's performing in front of millions every day. Scott was not put on television just to give blacks a reason to smile, no; he was liked by many of all races. He also got the chance to show that he could work with others of a different race. This is not to say that how Scott presented himself on TV was full of parody and whatnot; he took what he did seriously, for sure. Every June, when the Larry O'Brien Trophy was presented to the best team in the NBA, Stuart Scott was there for all of the postgame interviews and the announcing of the NBA Finals MVP, even as he was fighting internally what would soon take his life. He nailed it, effortlessly. But what cancer couldn't take were his spirit and his professionalism. The owner of the Dallas Mavericks, Mark Cuban said, "the only interview that mattered was the Stuart Scott interview on the last day of the NBA season." He conducted one-on-one interviews with some of sports' greatest athletes from Michael Jordan to Tiger Woods. Versatility is an understatement. Stuart Scott's contributions to the world of sports and to the world of broadcasting are only one part of the legacy he leaves behind. He was an inspiration for his colleagues and his instant infusion of talent and unconventional style has forever bucked the trend for how sports are casted on air and in the field. He helped to bring the field into the new century and amid criticism for how he did it, Stuart Scott kept it going until the end, genuinely staying "As cool as the other side of the pillow." Rest easy, Stuart.